The ROTATE= and REORDER options are specified to enhance factor interpretability. The ROTATE= PROMAX option produces an orthogonal varimax prerotation (default) followed by an oblique Procrustes rotation, and the REORDER option reorders the variables according to their largest factor loadings. An OUTSTAT= data set is created by PROC FACTOR and displayed in Output 37.2.15. PROC FACTOR can produce high-quality graphs that are very useful for interpreting the factor solutions. To request these graphs, ODS Graphics must be enabled. All ODS graphs in PROC FACTOR are requested with the PLOTS= option. In this example, you request a scree plot (SCREE) and loading plots for the factor matrix during the following three stages: initial unrotated solution (INITLOADINGS), prerotated (varimax) solution (PRELOADINGS), and promax-rotated solution (LOADINGS). 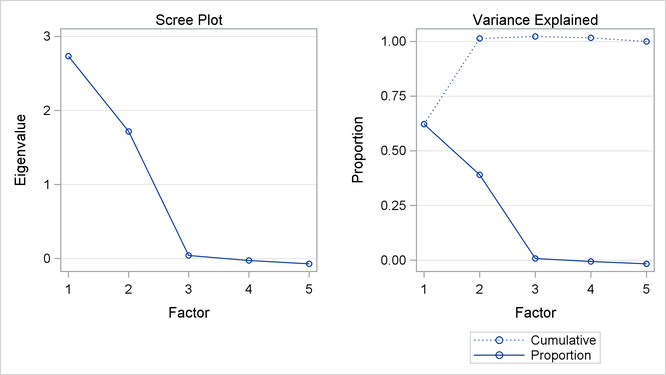 The scree plot helps you determine the number of factors, and the loading plots help you visualize the patterns of factor loadings during various stages of analyses. Output 37.2.1 displays the results of the partial correlations and Kaiser’s measure of sampling adequacy. If the data are appropriate for the common factor model, the partial correlations (controlling all other variables) should be small compared to the original correlations. For example, the partial correlation between the variables School and HouseValue is 0.65, slightly less than the original correlation of 0.86 (see Output 37.1.3). The partial correlation between Population and School is –0.54, which is much larger in absolute value than the original correlation; this is an indication of trouble. Kaiser’s MSA is a summary, for each variable and for all variables together, of how much smaller the partial correlations are than the original correlations. Values of 0.8 or 0.9 are considered good, while MSAs below 0.5 are unacceptable. The variables Population, School, and Employment have very poor MSAs. Only the Services variable has a good MSA. The overall MSA of 0.58 is sufficiently poor that additional variables should be included in the analysis to better define the common factors. A commonly used rule is that there should be at least three variables per factor. In the following analysis, you determine that there are two common factors in these data. Therefore, more variables are needed for a reliable analysis. Output 37.2.2 displays the results of the principal factor extraction. The square multiple correlations are shown as prior communality estimates in Output 37.2.2. The PRIORS= SMC option basically replaces the diagonal of the original observed correlation matrix by these square multiple correlations. Because the square multiple correlations are usually less than one, the resulting correlation matrix for factoring is called the reduced correlation matrix. In the current example, the SMCs are all fairly large; hence, you expect the results of the principal factor analysis to be similar to those in the principal component analysis. The first two largest positive eigenvalues of the reduced correlation matrix account for of the common variance. This is possible because the reduced correlation matrix, in general, is not necessarily positive definite, and negative eigenvalues for the matrix are possible. A pattern like this suggests that you might not need more than two common factors. The scree and variance explained plots of Output 37.2.3 clearly support the conclusion that two common factors are present. Showing in the left panel of Output 37.2.3 is the scree plot of the eigenvalues of the reduced correlation matrix. A sharp bend occurs at the third eigenvalue, reinforcing the conclusion that two common factors are present. These cumulative proportions of common variance explained by factors are plotted in the right panel of Output 37.2.3, which shows that the curve essentially flattens out after the second factor. For the current analysis, PROC FACTOR retains two factors by certain default criteria. This decision agrees with the conclusion drawn by inspecting the scree plot. The principal factor pattern with the two factors is displayed in Output 37.2.4. This factor pattern is similar to the principal component pattern seen in Output 37.1.5 of Example 37.1. For example, the variable Services has the largest loading on the first factor, and the Population variable has the smallest. 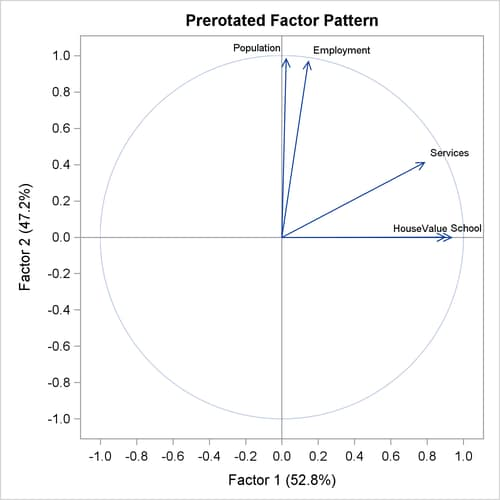 The variables Population and Employment have large positive loadings on the second factor, and the HouseValue and School variables have large negative loadings. Comparing the current factor loading matrix in Output 37.2.4 with that in Output 37.1.5 in Example 37.1, you notice that the variables are arranged differently in the two output tables. This is due to the use of the REORDER option in the current analysis. The advantage of using this option might not be very obvious in Output 37.2.4, but you can see its value when looking at the rotated solutions, as shown in Output 37.2.7 and Output 37.2.11. The final communality estimates are all fairly close to the priors (shown in Output 37.2.2). Only the communality for the variable HouseValue increased appreciably, from 0.847 to 0.885. Therefore, you are sure that all the common variance is accounted for. Output 37.2.5 shows that the residual correlations (off-diagonal elements) are low, the largest being 0.03. The partial correlations are not quite as impressive, since the uniqueness values are also rather small. These results indicate that the squared multiple correlations are good but not quite optimal communality estimates. 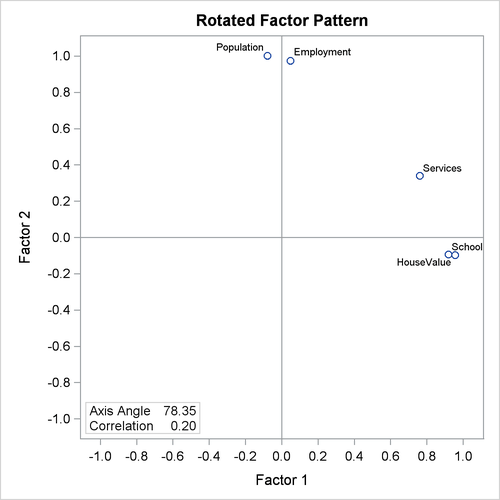 As displayed in Output 37.2.6, the unrotated factor pattern reveals two tight clusters of variables, with the variables HouseValue and School at the negative end of Factor2 axis and the variables Employment and Population at the positive end. The Services variable is in between but closer to the HouseValue and School variables. A good rotation would place the axes so that most variables would have zero loadings on most factors. As a result, the axes would appear as though they are put through the variable clusters. In Output 37.2.7, the results of the varimax prerotation are shown. To yield the varimax-rotated factor loading (pattern), the initial factor loading matrix is postmultiplied by an orthogonal transformation matrix. This orthogonal transformation matrix is shown in Output 37.2.7, followed by the varimax-rotated factor pattern. This rotation or transformation leads to small loadings of Population and Employment on the first factor and small loadings of HouseValue and School on the second factor. Services appears to have a larger loading on the first factor than it has on the second factor, although both loadings are substantial. Hence, Services appears to be factorially complex. For orthogonal factor solutions such as the current varimax-rotated solution, you can also interpret the values in the factor loading (pattern) matrix as correlations. For example, HouseValue and Factor 1 have a high correlation at 0.94, while Population and Factor 1 have a low correlation at 0.02. The variance explained by the factors are more evenly distributed in the varimax-rotated solution, as compared with that of the unrotated solution. Indeed, this is a typical fact for any kinds of factor rotation. In the current example, before the varimax rotation the two factors explain 2.73 and 1.72, respectively, of the common variance (see Output 37.2.4). After the varimax rotation the two rotated factors explain 2.35 and 2.10, respectively, of the common variance. However, the total variance accounted for by the factors remains unchanged after the varimax rotation. This invariance property is also observed for the communalities of the variables after the rotation, as evidenced by comparing the current communality estimates in Output 37.2.7 with those in Output 37.2.4. Output 37.2.8 shows the graphical plot of the varimax-rotated factor loadings. 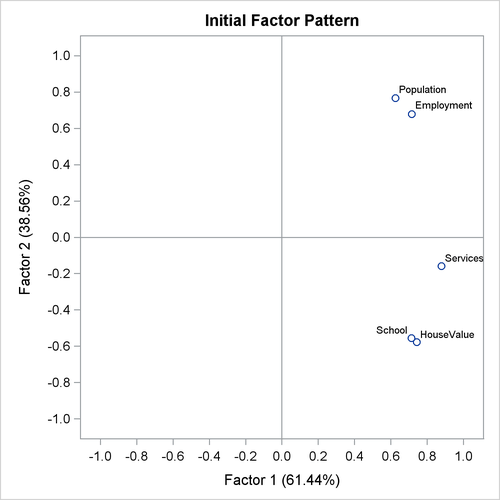 Clearly, HouseValue and School cluster together on the Factor 1 axis, while Population and Employment cluster together on the Factor 2 axis. Service is closer to the cluster of HouseValue and School. This generates the vector plot of loadings in Output 37.2.9. PROC FACTOR provides a very large class of oblique factor rotations. The current example shows a particular one—namely, the promax rotation as requested by the ROTATE= PROMAX option. The results of the promax rotation are shown in Output 37.2.10 and Output 37.2.11. The corresponding plot of factor loadings is shown in Output 37.2.12. Output 37.2.10 shows the Procrustean target, to which the varimax factor pattern is rotated, followed by the display of the Procrustean transformation matrix. This is the matrix that transforms the varimax factor pattern so that the rotated pattern is as close as possible to the Procrustean target. However, because the variances of factors have to be fixed at 1 during the oblique transformation, a normalized version of the Procrustean transformation matrix is the one that is actually used in the transformation. This normalized transformation matrix is shown at the bottom of Output 37.2.10. Using this transformation matrix leads to the promax-rotated factor solution, as shown in Output 37.2.11. After the promax rotation, the factors are no longer uncorrelated. As shown in Output 37.2.11, the correlation of the two factors is now 0.20. In the (initial) unrotated and the varimax solutions, the two factors are not correlated. For example, factor loadings of Services and Population on Factor 2 are 0.415 and 0.989, respectively, in the (orthogonal) varimax-rotated factor pattern (see Output 37.2.7). With the (oblique) promax rotation (see Output 37.2.11), these two loadings become even more differentiated with values 0.339 and 1.002, respectively. Overall, however, the factor patterns before and after the promax rotation do not seem to differ too much. This fact is confirmed by comparing the graphical plots of factor loadings. The plots in Output 37.2.12 (promax-rotated factor loadings) and Output 37.2.8 (varimax-rotated factor loadings) show very similar patterns. Unlike the orthogonal factor solutions where you can interpret the factor loadings as correlations between variables and factors, in oblique factor solutions such as the promax solution, you have to turn to the factor structure matrix for examining the correlations between variables and factors. Output 37.2.13 shows the factor structures of the promax-rotated solution. Basically, the factor structure matrix shown in Output 37.2.13 reflects a similar pattern to the factor pattern matrix shown in Output 37.2.11. The critical difference is that you can have the correlation interpretation only by using the factor structure matrix. For example, in the factor structure matrix shown in Output 37.2.13, the correlation between Population and Factor 2 is 0.986. The corresponding value shown in the factor pattern matrix in Output 37.2.11 is 1.002, which certainly cannot be interpreted as a correlation coefficient. However, the communalities for the variables, as shown in the bottom of Output 37.2.13, do not change from rotation to rotation. They are still the same set of communalities in the initial, varimax-rotated, and promax-rotated solutions. This is a basic fact about factor rotations: they only redistribute the variance explained by the factors; the total variance explained by the factors for any variable (that is, the communality of the variable) remains unchanged. In the literature of exploratory factor analysis, reference axes had been an important tool in factor rotation. Nowadays, rotations are seldom done through the uses of the reference axes. Despite that, results about reference axes do provide additional information for interpreting factor analysis results. For the current example of the promax rotation, PROC FACTOR shows the relevant results about the reference axes in Output 37.2.14. To explain the results in the reference-axis system, some geometric interpretations of the factor axes are needed. Consider a single factor in a system of n common factors in an oblique factor solution. Taking away the factor under consideration, the remaining n – 1 factors span a hyperplane in the factor space of n – 1 dimensions. The vector that is orthogonal to this hyperplane is the reference axis (reference vector) of the factor under consideration. Using the same definition for the remaining factors, you have n reference vectors for n factors. Output 37.2.14 shows the reference axis correlations. The correlation between the reference vectors is –0.20. Next, Output 37.2.14 shows the loadings on the reference vectors in the table entitled "Reference Structure (Semipartial Correlations)." As explained previously, loadings on a reference vector are also the unique effects of the corresponding factor, partialling out the effects from the all other factors. For example, the unique effect of Factor 1 on HouseValue is 0.936. Another important property of the reference vector system is that loadings on a reference vector are also correlations between the variables and the corresponding factor, partialling out the correlations between the variables and other factors. This means that the loading 0.936 in the reference structure table is the unique correlation between HouseValue and Factor 1, partialling out the correlation between HouseValue with Factor 2. Hence, as suggested by the title of table, all loadings reported in the "Reference Structure (Semipartial Correlations)" can be interpreted as semipartial correlations between variables and factors. The last table shown in Output 37.2.14 are the variances explained by the reference vectors. As explained previously, these are also unique variances explained by the factors, partialling out the variances explained by all other factors (or eliminating all other factors, as suggested by the title of the table). In the current example, Factor 1 explains 2.248 of the variable variances, partialling out all variable variances explained by Factor 2. Notice that factor pattern (shown in Output 37.2.11), factor structures (correlations, shown in Output 37.2.13), and reference structures (semipartial correlations, shown in Output 37.2.14) give you different information about the oblique factor solutions such as the promax-rotated solution. However, for orthogonal factor solutions such as the varimax-rotated solution, factor structures and reference structures are all the same as the factor pattern. The output data set is displayed in Output 37.2.15. As shown in Output 37.2.16, the input data set is of the FACTOR type for the new rotation. The quartimax-rotated factor pattern is displayed in Output 37.2.17. The quartimax rotation produces an orthogonal transformation matrix shown at the top of Output 37.2.17. After the transformation, the factor pattern is shown next. Compared with the varimax-rotated factor pattern (see Output 37.2.7), the quartimax-rotated factor pattern shows some differences. 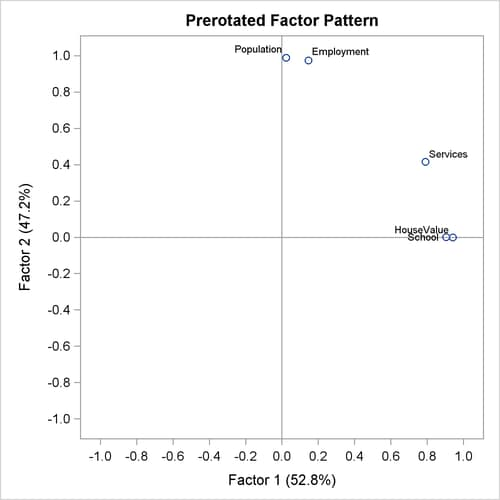 The loadings of HouseValue and School on Factor 1 drop only slightly in the quartimax factor pattern, while the loadings of Services, Population, and Employment on Factor 1 gain relatively larger amounts. The total variance explained by Factor 1 in the varimax-rotated solution (see Output 37.2.7) is 2.350, while it is 2.370 after the quartimax-rotation. In other words, more variable variances are explained by the first factor in the quartimax factor pattern than in the varimax factor pattern. Although not very strongly demonstrated in the current example, this illustrates a well-known property about the quartimax rotation: it tends to produce a general factor for all variables. Output 37.2.18 shows the variable weights in the rotation. While all other variables have weights at least as large as 0.93, the weight for Services is only 0.12. This means that due to its small weight, Services is not as important as the other variables for determining the rotation (transformation). This makes sense when you look at the initial unrotated factor pattern plot in Output 37.2.6. 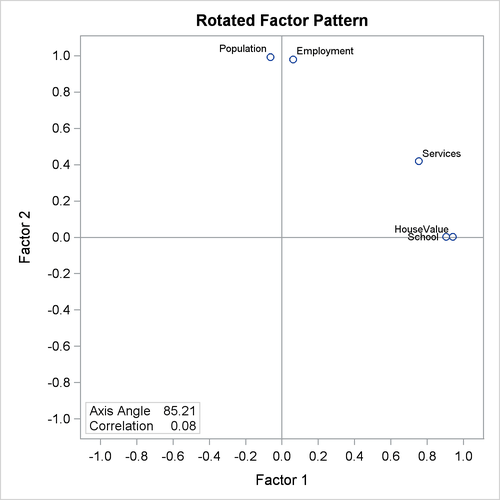 In the plot, there are two main clusters of variables, and Services does not seem to fall into either of the clusters. In order to yield a Harris-Kaiser rotation (transformation) that would gear towards to two clusters, the Cureton-Mulaik weighting essentially downweights the contribution from Services in the factor rotation. The results of the Harris-Kaiser factor solution are displayed in Output 37.2.19, with a graphical plot of rotated loadings displayed in Output 37.2.20. Because the Harris-Kaiser produces an oblique factor solution, you compare the current results with that of the promax (see Output 37.2.11), which also produces an oblique factor solution. The correlation between the factors in the Harris-Kaiser solution is 0.084; this value is much smaller than the same correlation in the promax solution, which is 0.201. However, the Harris-Kaiser rotated factor pattern shown in Output 37.2.19 is more or less the same as that of the promax-rotated factor pattern shown in Output 37.2.11. Which solution would you consider to be more reasonable or interpretable? Although the Harris-Kaiser and the promax factor patterns are very similar, the graphical plots of the loadings from the two solutions paint slightly different pictures. The plot of the promax-rotated loadings is shown in Output 37.2.12, while the plot of the loadings for the current Harris-Kaiser solution is shown in Output 37.2.20. The two factor axes in the Harris-Kaiser rotated pattern (Output 37.2.20) clearly cut through the centers of the two variable clusters, while the Factor 1 axis in the promax solution lies above a variable cluster (Output 37.2.12). The reason for this subtle difference is that in the Harris-Kaiser rotation, the Services is a "loner" that has been downweighted by the Cureton-Mulaik technique (see its relatively small weight in Output 37.2.18). As a result, the rotated axes are basically determined by the two variable clusters in the Harris-Kaiser rotation.